These instructions should take you about 15 minutes to complete. The WebPhone is fully integrated into the dmSwitchboard12 and is the quickest and simplest way to make and receive calls from your switchboard. These instructions tell you how to access your WebPhone once a switchboard owner has allocated an extension to you. They also tell you how to download and install the necessary plugin, if you have not already done so. For the WebPhone to work on your computer, you will need to download and install this Plugin from the Zoiper Website. If you use more than one browser to access your Clubhouse, you will need to install the WebPhone in each of them on first use. It is assumed that your personal extension has already been configured to work with the webphone and that you have received the WebPhone email notification. 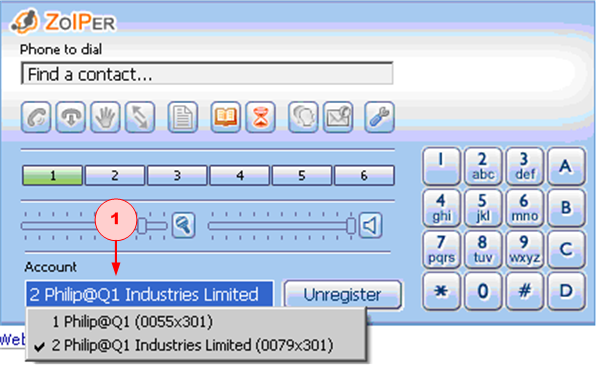 Data that you need to hand before you start is labelled Required in the Rule & Origins Column. a) If you are already logged in (you may well be, if you have just updated a Plan) log out. b) Log in to your clubhouse. If this is the first time that you have logged in, use the ID given in the notification email that you have received. c) When the Clubhouse is displayed, you will see an alert at the top of the window telling you that you have access to the WebPhone. d) Click the WebPhone icon in the Webphone Zone (not in the alert). If you are using the WebPhone for the first time, and the WebPhone is not installed on your computer, continue from Step 2. If the WebPhone is already installed on your computer continue from Step 3. You now need to download the Plugin before launching the WebPhone. Note that, depending on your browser's security settings, some of these steps will not be required. When you click the WebPhone icon, the following window is displayed. a) Click the link on the Plugin Installation Instructions Page (1). A dialog is displayed asking if you wish to save or cancel the installer. b) Click SAVE FILE (2) and the Firefox downloads window is displayed. c) Double-click the download. A message may be displayed telling you that the file is an executable and asking you if you are sure that you wish to launch the download. d) Click OK. A further security message is displayed asking you to confirm that you wish to run the file. e) Click RUN. The Zoiper Setup: Installing window is briefly displayed while the files are executed and installed. The window closes once installation is complete. f) Click RELOAD PAGE (3) on the Plugin Installation Instructions Page. Depending on your Windows security setting, the following Windows Security Alert may be displayed. g) Click UNBLOCK (4) and the WebPhone is displayed. You should now test the WebPhone and familiarise yourself with its controls. If you have already installed the plugin, the WebPhone is displayed when you click the icon in the WebPhone zone. A single WebPhone can give you access to all of your dmSwitchboard12 accounts. When you open the WebPhone, you are registered to the dmSwitchboard12 account which has the lowest numeric identifier. If that is the account that you wish to use, the WebPhone is ready to make and receive calls. a) Select the appropriate account from the list shown in the ACCOUNT drop-down menu (1). b) Your WebPhone is now ready to make and receive calls with the selected account. The WebPhone comes with some buttons that let your carry out some quick and simple test to make sure that it is working. This test allows you to make sure that your microphone and speakers are working correctly. a) Launch the WebPhone and click Audio Setup ((1), in the previous figure). 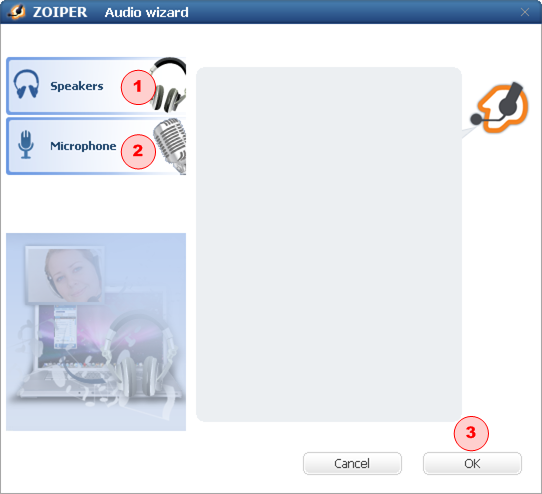 The Zoiper Audio Wizard is displayed. 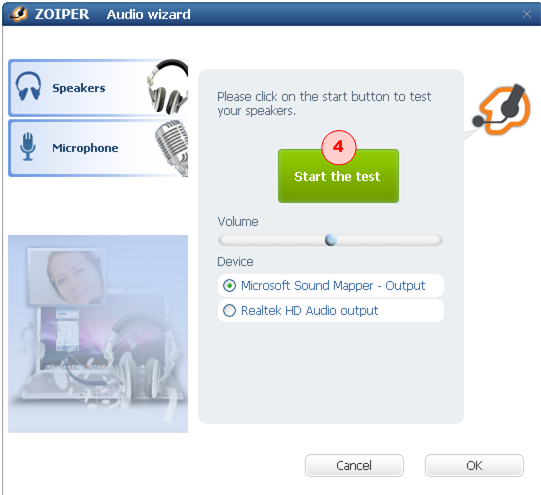 b) To test the speakers, click (1), and the Speaker test screen is displayed. d) Click Microphone (2) and the Microphone test screen is displayed. The Volume marker moves, your microphone is working. Click YES. f) The test is complete, click OK and the Zoiper Audio Wizard is dismissed. Call the Test Music extension, this is the Playback Test. To do this, click the second orange button (2) beneath the webphone shown under Theory, above. Call the Echo Test extension. To do this, click the third orange button (3) beneath the webphone shown under Theory, above. When you are connected, speak and you will hear your words echoed back to you following a short delay. To log out of the WebPhone, simply close its window by clicking on the 'X' at the top right-hand side. Now that you can log in and out of your WebPhone, you can learn how to make and receive calls and manage the WebPhone's in-call features. Click here to go to Using the WebPhone: Making and receiving calls. If you would like to carry out more tests on your WebPhone, click here: dmSwitchboard12 WebPhone: Testing.